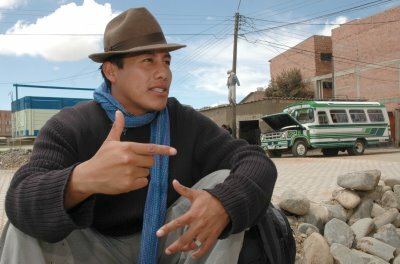 Photo of Abraham Bojorquez by Wara Vargas / http://www.lamalapalabra.tk and used with permission. I don’t tend to be very expressive during moments of pain, but the sudden death of Abrahan Bohórquez has cracked something in my soul. A young artist with much to offer, with a fair and visionary outlook on many things in our country. the Ukamau y Ké that allowed me to know the political leanings and aesthetics of our country. In addition, it allowed to lay urgent bridges with my daughter … to be able to continue in this cruel world. It was truly an unfortunate loss for many … listening to Abraham’s songs, we learn about the reality of the youth, of the fight against racism and about many of our own contradictions.